Dr. Cannon Doan and our team know that as a parent, you want your child to be as healthy as possible. By now, you probably know that your son or daughter’s oral health plays a huge role in overall health. When there are so many toothpaste ads and different styles of brush to choose from, it can be difficult to know which will serve your child the best. We recommend you break down the decision process to make it simpler. First, your child’s age and stage of development are vital to consider. Until about the age or 12, your youngster may not be prepared to brush or floss adequately alone, due to dexterity issues. If that’s the case, it can be easier to use a battery-powered toothbrush to improve the quality of brushing. Next is to select the right size of toothbrush head to fit your child’s mouth. 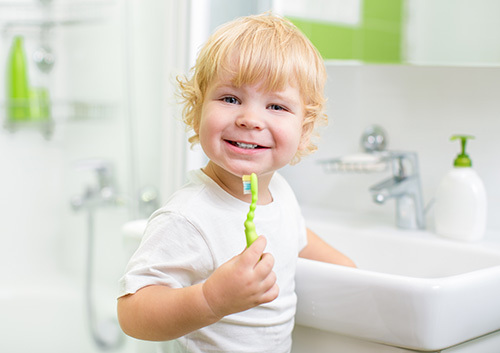 As a general rule, the head of the toothbrush should be a little larger than the upper portion of the child’s thumb. Flossers are great for children and easy to use. They have handles and a horseshoe shape on one end with floss in between. Your child can choose a color he or she likes as well as the handle size, shape, etc. Not only are there many brands of toothpaste to choose from, there are also many different ingredients that offer varying benefits. Kids are at high risk for developing cavities so you want to make sure the following ingredients are in your child’s toothpaste if you wish to avoid problems later on. Sodium fluoride is the standard ingredient for cavity prevention, while stannous fluoride is anti-bacterial and anti-cavity. Anti-sensitivity toothpastes often contain potassium nitrate, and triclosan can be found in one particular brand for anti-bacterial action. Fluoride should not be ingested, so if your child can’t spit yet, use a toothpaste that contains xylitol. This is a natural sweetener and should be the first ingredient listed on the tube. Now comes the fun part: choosing a flavor! Your little one may sample different flavors and select the one he or she likes the best. A youngster is more likely to adopt good brushing habits if the flavor is appealing. Don’t hesitate to speak with Dr. Cannon Doan if you need to make an appointment at our Cordova office, or if you have any questions about toothpastes or toothbrushes.